Fiber? You didn't see any fiber down there. There's dark fiber, and then there's really dark fiber, or what we'll call "black" fiber. Construction crews inevitably will accidentally cut a fiber line when doing underground construction. It's par for the course. However,what it isn't par for the course is cutting into a fiber line and then within moments, three black sport-utility vehicles drive up, a half-dozen men in [black] suits jump out and one says, "You just hit our line." According to the The Washington Post, a fiber cut in Tysons Corner brought a visit from men in suits driving black SUVs. When the construction crew asked "Whose line?" the black suits didn't answer. The article states, "The construction manager was shocked," Georgelas recalled. "He had never seen a line get cut and people show up within seconds. Usually you've got to figure out whose line it is. To garner that kind of response that quickly was amazing." According to the article, "the cable in question was "black" wire -- a secure communications line used for some of the nation's most secretive intelligence-gathering operations." 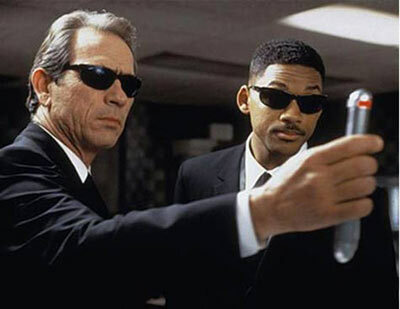 Think NSA or even deeper - Men In Black, responsible for tracking those pesky illegal alien immigrants and keeping them out of trouble. Relatedly, rumor has it President Obama is an alien - a Vulcan I might add. I'm skeptical the MIB showed up so quickly because it's their critical secure line. I'm thinking they were playing World of Warcraft across government buildings and were mighty peeved when they lost their private data connection causing the game to freeze up. "Dude, I so had you PWNed! Now go and find out who the heck cut our line!" There's dark fiber, and then there's really dark fiber, or what we'll call \"black\" fiber. Construction crews inevitably will accidentally cut a fiber line when doing underground construction. It's par for the course. However,what it isn't par for the course is cutting into a fiber line and then within moments, three black sport-utility vehicles drive up, a half-dozen men in [black] suits jump out and one says, \"You just hit our line.\"
According to the The Washington Post, a fiber cut in Tysons Corner brought a visit from men in suits driving black SUVs. When the construction crew asked \"Whose line?\" the black suits didn't answer. The article states, \"The construction manager was shocked,\" Georgelas recalled. \"He had never seen a line get cut and people show up within seconds. Usually you've got to figure out whose line it is. To garner that kind of response that quickly was amazing.\"
According to the article, \"the cable in question was \"black\" wire -- a secure communications line used for some of the nation's most secretive intelligence-gathering operations.\" Think NSA or even deeper - Men In Black, responsible for tracking those pesky illegal alien immigrants and keeping them out of trouble. Relatedly, rumor has it President Obama is an alien - a Vulcan I might add. I'm skeptical the MIB showed up so quickly because it's their critical secure line. I'm thinking they were playing World of Warcraft across government buildings and were mighty peeved when they lost their private data connection causing the game to freeze up. \"Dude, I so had you PWNed! Now go and find out who the heck cut our line!\"